I had the urge for a quick finish so I stitched up this ornament. I madethis little ornament last year, it's from a very old Sheepish design. I did a gift for one of my dearest friend. Well, this is my April ornie, yep, I'm still making my way through the JCS 2006 ornie issue! I'm getting good value out it :) Love this design, there is a little error on the left of the chart as I think other people have mentioned but nothing serious. I used the recommended fabric and thread, apart from the pot which is GAST Cinnamon because I don't have WDW hazelnut. But just look at it compared to the photo! I'm quite disappointed in the rather overripe looking pears (CC Sassy Brass) which is very brown in places and in the border (CC Joshua Tree) which doesn't really show up at all. Oh well, I guess that's the randomness of variegated threads! I think I might rechristen it 'Little Nut Tree' instead! 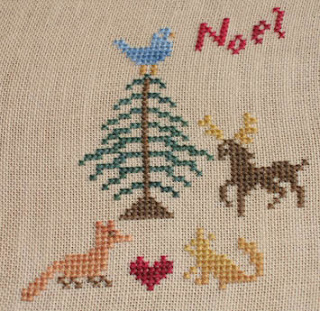 I've also made some progress on Praiseworthy Stitches 'The Bird's Carol', I'm really enjoying this and hope to finish it soon, so I'll be one up and perhaps have a month of the SAL for finishing like Nicki suggested. This's another EEF design, very strange and unusual Christmas tree . I liked to stitch it. The Courtyard of Alhambra by Periphaeria Designs stitched with WDW Noel (1 over 2) on 35 ct Antique White Weddigen Linen. On the back I stitched parts of the design only and finished it as a biscornu. 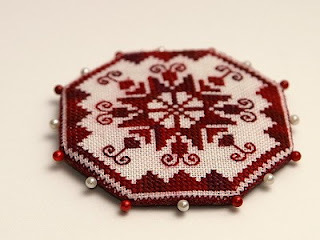 I've finished stitching one and a half ornaments this month to make up for my poor performance last month, but I'm only showing the finished one. It's Snow Bird by La-D-Da from the 2004 JCS ornament magazine. I actually had the recommended 36ct linen and thread, which was a minor miracle! It's not finished finished as I didn't pack any fabrics or ribbons in the suitcase. I'm going to have a finishing frenzy later in the year when my stuff arrives. Speaking of which - I was thinking of having a mid-year finishing weekend. Would anyone be interested in joining me? How does the first weekend of July sound? This is my April ornament. It's Piti Kado, a freebie from Lune d'Automne, as a snowflake. I have used two DMC threads: a strand of E5200 of Pearlescent Effects collection and a strand of E940 of Glow-In-The-Dark Effects; the fabric is a 28ct Cashel linen Millenium blue by Zweigart. Actually, it shines in the dark. This a very very old EEF design, I made it as silhouette and I usally hang it on my front door for Christmas time. I just love it. It's the April SAL weekend! I just wanted to pop in and say what a wonderful load of ornaments you've all been stitching! I'm sorry I haven't been able to comment on them all but I've been moving house and then I've been away too. If any of you need your blog addresses changing or updating, please let me know and I'll do it as soon as possible. The same with invites if anyone wants to join in. Looking forward to a lovely lot of pictures this weekend. Happy stitching! 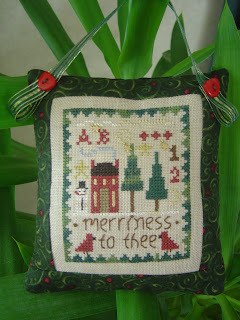 Next weekend there won t be time for stitching, therefore -better earlier than never :-) -the ornament for april. 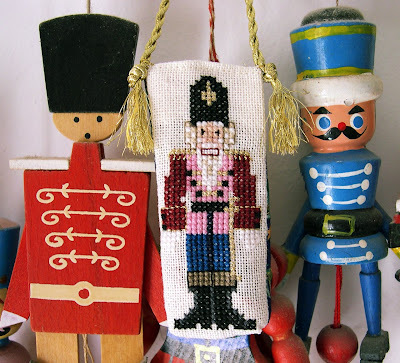 It is Just nans nutcracker from JCS-Ornaments. The nutcracker will be the "cinnamon stick carrier" next christmas. I'm a little early because I thought the ornament SAL was last weekend! So I suppose now I can stitch another one. 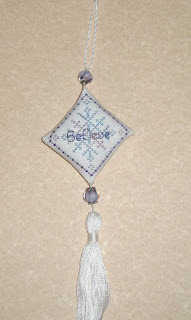 This is Brightneedle's To Thee Hope from the 2006 JCS ornament edition. This is from the JCS 2006 ornament issue. 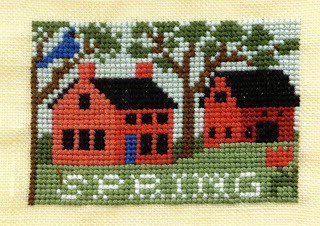 I also stitched the Spring, Summer and Autumn iin that seaon series. I did this small penguin over one last weekend. I wish all my ornie choices stitched this fast! 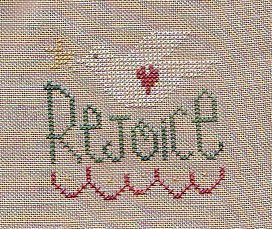 Well I managed to sit through the second disc of the BBC 6 part series of Pride & Prejudice (Colin Firth as Mr Darcy) and stitched this last night. 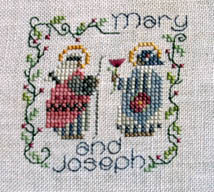 Stitched on flecked aida, which the scan doesn't show, using DMC. May I whine? I have nothing to show for my Christmas ornies for the past 2 months!! I've been so busy trying to catch up with my regular WIPs that the Christmas thingies have been forgotten in the vast pile of things. HELP! I keep promising myself to do one, and it never gets to my hands! Any and all enabling and encouraging and helpful hints would be much appreciated. Oh yes you can see that I am waaay behind with my ornaments. Last night I wanted to stitch something quick, so chose this San Man Originals Design called Freeze and stitched it on flecked aida using a WDW. I'm pleased with how it has turned out. 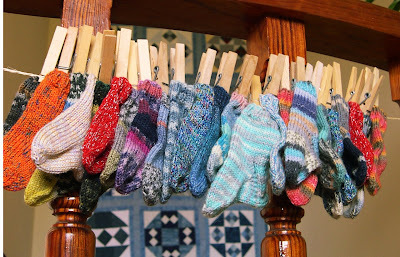 Since a very long time I wanted to have a christmas calendar made of 24 socks. Here they are. Without this SAL , for sure, I never wouldn t have made them . Here is my ornament for April. 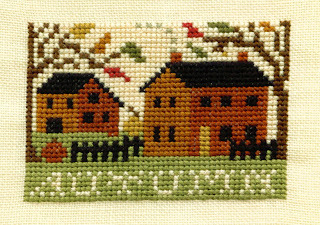 Another fun stitch that was quick to do. It is Icy Snowflake, a "Tiny Treasured Diamond" kit by Mill Hill. This was my first time with one of these kits and I really enjoyed working it. The other piece is Lady Scarlet's Secret garden, which I finished over the weekend (sorry, this is the best picture of the ornie I could get and she was in it too). I know I'm late again. 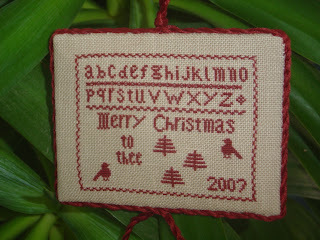 I stitched this ornament in March(! ), but now it's finally finished. 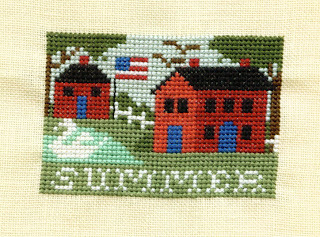 It's Emblem of friendship (Louise Henderson, Cherished Stitches; JCSCO 2006), finished as/like(?) a pinkeep. I like these quaker-designs very much. They are so clear and simple but never boring. Nicky, would you be so kind to change my blog-link. The new blog-link is this . Thank you very much! I did the finishing on my January ornament today - I have been making beads out of glass for the past two years, and luckily I found two beads that matched the ornament perfectly! They're at the top and bottom of the ornament. 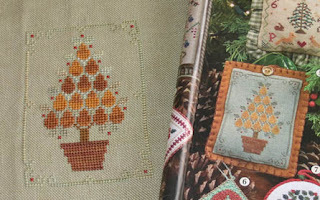 The first two are from a book of old Dutch sampler motifs, the last from a old French motif book. No, your eyes aren't fooling you if this ornament looks familiar... yes I've stitched it for a second time this year. 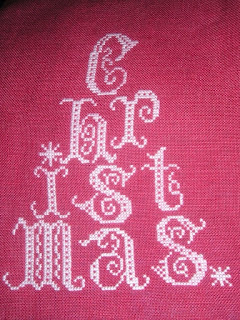 The frist time I stitched the ornament was through a RR I was in. This second time was from a kit I bought almost a year ago from Jeannette Douglas. These ornies are from a Debbie Mumm kit. There are 12 altogether in the package. This photo shows how far I got during the last week of March before I switched back to my stocking project. These ornies need the french knots, back stitching and the cutting out from the plastic canvas to be completed which will be done for the April SAL. I have a new Obsession - SEWING. hi everyone, what a fantastic lot of ornaments again this month. Here are my two for March, I'm a little late in posting this time. Not Exactly an Ornament, but Christmas-y. 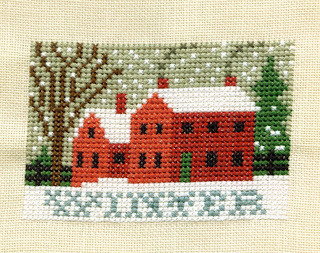 Although I did not finish an ornament last weekend, I have been working on this design, Random Thoughts of Winter by Erica Michaels for Project Spectrum. I did make some extensive changes in fabric and threads. Information about what I used can be found in my blog. It will be framed rather than made into the suggested pillow. Some of these motifs would probably make some cute ornaments.